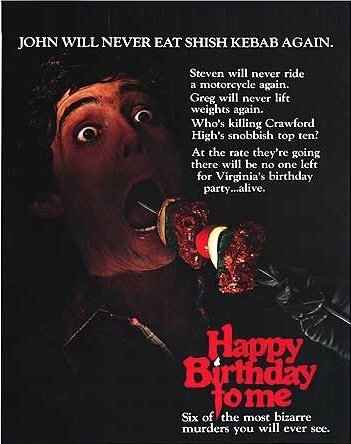 Possessing more in common with the original Friday The 13th than that classic’s Jason-centric sequels, Happy Birthday To Me is a slasher film by way of whodunit, one in which endless misdirections go hand in hand with inventively gruesome murders. Directed by Cape Fear’s J. Lee Thompson, the film concerns a group of boarding school friends (known as the “top 10”) who are methodically picked off by a mysterious assailant. Only the black-gloved hands of that fiend are seen during these killings (in a nod to the work of Dario Argento and his giallo comrades). And it’s suggested from the narrative’s focus that the homicidal maniac’s main target may be Ginny (Little House On The Prairie’s Melissa Sue Anderson), the clique’s newest member and a young woman still suffering the effects of a horrific car crash that killed her mother (whose grave she visits in the dead of night) and left her in a comatose state, only to be reanimated by experimental brain-cell-regenerating surgery. Grisly deaths soon begin piling up, first via strangulation, then by motorcycle wheel and barbell, which Thompson stages with a requisite amount of gruesome flair. Better, however, is the pervasive sense of madness that infects Happy Birthday To Me, most of it stemming from Ginny, whose shaky ability to delineate reality from fantasy—no thanks to her psychiatrist (a barely invested Glenn Ford)—casts doubt over virtually every aspect of what’s being dramatized. The script’s slow trickle of revelations eventually becomes a torrent, disclosing the way in which past traumas (of both a physical and emotional sort) inevitably breed psychosis. Yet the material’s lasting power primarily comes from its memorable shish kebab centerpiece (which is featured on its poster) as well as its finale, which not only provides an explanation for its title but also thrusts the film into a realm of preposterous nightmare insanity that’s all the more unforgettable for making little lucid sense. Availability: Happy Birthday To Me is available on DVD from Amazon, Netflix, and possibly your local video store/library. It can also be rented or purchased from Amazon or iTunes.